OpenCart Marketplace Seller Sub Account: Using Opencart Marketplace Sub Seller Module, the seller can add their sub-seller with the specific permissions. The sub seller can also log in as a customer with their own credentials and work for the seller as per the given permissions. The sub seller can manage products, orders and all the menu options on behalf of the seller. 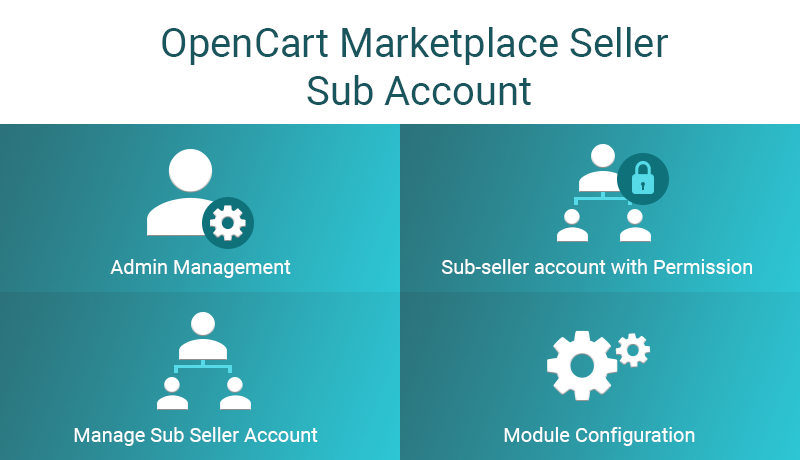 OpenCart Marketplace Seller Sub Account: Using Opencart Marketplace Sub Seller Module, the seller can create their sub-accounts with the specific permissions. The sub account user can also log in as a customer with its own credentials and work for the seller as per the given permissions. The sub account user can manage products, orders and all the menu options on behalf of the seller. Important Note - This extension is an add-on to the marketplace module, you must first install the Webkul OpenCart Marketplace to use Seller Sub Account module. The Admin and the Vendors can create multiple sub-accounts. Sub-accounts can be created store-wise. The admin can set the limit of sub-sellers that a seller can create. The admin can add the permissions that will be available to the sellers. The Admin/Vendor can delete/edit existing sub-accounts. The Admin can create sub-accounts for the Vendors. Each sub-seller have their own account and credentials. Both, the Admin and the Vendors can assign specific roles to the sub-account users. Enabling or Disabling the extension for use. Selecting the Store for which you want to create the sub-account. Set the limit of sub-sellers that the sellers will be able to add. Choose the permissions that you want to provide the sellers which can then be assigned to the sub-sellers. Admin can set the mail be sent when a sub-seller is created. Lastly, save the configuration by clicking the Save button. As the seller had provided access permission for – My Profile, Dashboard, and Order History the same is being reflected in the sub-users account panel. The sub-user can now access with full control the seller’s My Profile, Dashboard, and the Order History in place of the seller in a separate account. The admin can find a complete list of all the marketplace sub-sellers listed under Marketplace->Sub-Seller list. Here, the admin can also add/delete sub-seller/user accounts for the marketplace sellers by clicking on the add & delete button. Did you buy OpenCart Marketplace Seller Sub Account?